Windows 7 and Windows 8 are the popular operating systems used in majority of the PC systems these days. With Microsoft finally releasing the date for Windows 8 final version, users are expecting to taste Metro UI feature of this latest operating system. Don’t you have the patience for waiting for so long? Well, you can experience Metro UI feature with a new browsing app – the Immersive Explorer. Now the time has come to bring a change to the mode of browsing of files. Immersive Explorer is a new app which has come up to relieve you from the mundane Windows Explorer. This is a metro style, streamlined and clean application for file browser. This Windows Explorer replacement is designed completely with Metro UI interface. This file browser app is a perfect alternative to your default Windows Explorer. 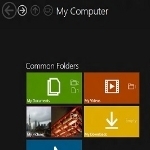 With Windows 8 Metro UI design, this browser application primarily intends to provide you easy accessibility to contents instead of displaying a number of toolbars and icons and hiding the actual contents behind these icons. This app enables you to do the simple task in the simple way. Now, you no longer have to open multiple applications or navigate through multiple windows in order to perform a simple task as watching some photo. For instance, say you wish to view one JPEF file. You do not have to open up Windows Photo Viewer; you will get to see the JPEF file in the window of Immersive Explorer directly. Moreover, it is expected that many new features like streaming of video and audio and some basic image modifying tools like resizing, rotating and cropping will be included in this file explorer. Browsing file in Immersive explorer is at your fingertips – you do not have to give much effort in that. When you want to open a file in this Explorer, just double click it and it will be opened, provided the file type is supported by the Explorer. So, just double click your desired picture file in this Explorer and you will be able to view the image you desire. Want to a particular file property? Just double click on it and the properties will be displayed in Immersive Explorer. You also have the facility to view SHA-1 and MD5 hash checksums of any file together with their properties in Immersive Explorer. Amongst the features that are expected to be found in this latest browser are modernized view sorting and filters, touchscreen support, playback support, picture manipulations and file operations. Thanks to Julien Manici for creating such a functional app for the PC users. You know Immersive Explorer doesn’t require any administrative privilege for using it! These exciting features are only added to its first release. Many other features are awaited to be added in the future release. So, grab this opportunity of using this interesting Immersive Explorer! Author’s Bio: Want to know about any app? Contact Stacy Bruce, the Windows 7 Support expert. Get the help you are searching for! Windows Talk browsing, windows explorer. permalink. This program is useless to me. I can’t copy and paste from other windows, I can’t adjust the view to show what I want it to (in my case, the 14 hard drives on this machine), it won’t “remember” which monitor it launched/closed on, and in general file manipulation is a no-go with this. It is most definitely a no-go for serious users of the file system on a computer. It looks cool, I launch it when people are looking over my shoulder, but other than being eye candy it’s just not functional enough for any kind of serious computer user. It might be great for grandma to find pics and stuff, I’ll probably never find out though because on an octocore system running 8 cores at over 4 GHZ it uses up nearly 20% of total clock cycles. That’s pretty heavy duty resource hogging so it’s NEVER going to see grandma’s ancient Dell laptop. I thought maybe it would substitute for media center so I put it on my HTPC, just to see what happened. The IR remote doesn’t work in it, it hogs the resources of the machine so badly that when you try to play something it’s unwatchable. This is an interesting but useless GUI that needs a lot more work before it can go primetime. If I can find a download for this will it work on the XP dinosaur? That was my question too, and I saw no download link. Maybe i did not see the download for the app ? Do you have a link handy for download ?